Marriage isn’t always loving, kind, and honest. Sometimes it’s the things that we hide that say the most about who we are. David Fincher’s latest film dissects the modern marriage and explores just how difficult the arrangement can be. We often like to put labels on things, it makes them mean something more and it lets us become complacent. A young couple falls in love, they find meaning with each other, and then they want to share that with the world. This leads to marriage, children, and a future together. But marriage isn’t always the happily ever after that many couples idealise it to be. Instead it can be difficult to maintain, sometimes it can hurt the individual, and often it ends in divorce. Are humans meant to live in monogamy? Gone Girl suggests that perhaps we’re not. David Fincher’s latest film borrows stylistically from his vapid (but well shot) The Girl With the Dragon Tattoo (2011) and narratively from his twisty thriller The Game (1997). It finds it’s own tone and pacing however and its procedural edge comes straight from Fincher’s Zodiac (2007). 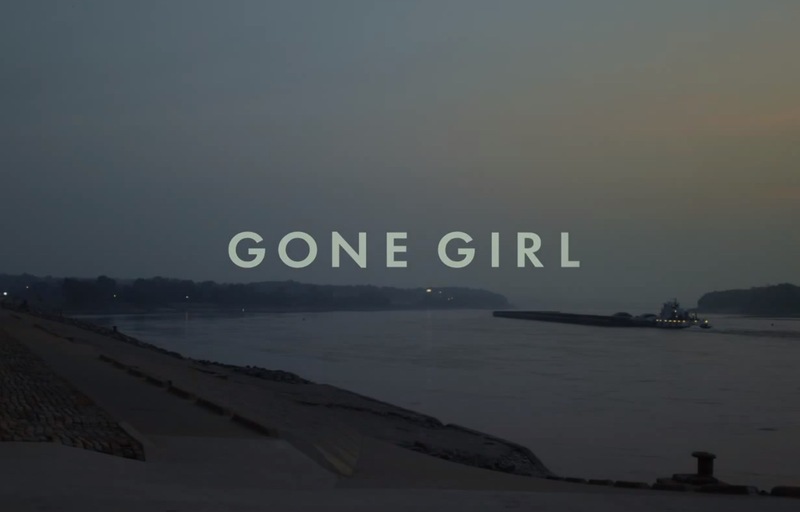 Gone Girl is a clever film and it plays with the audience and its expectations to great effect. The narrative follows the story of Nick (Ben Affleck) and Amy (Rosamund Pike), a couple approaching middle age who live in New York City. Nick is a Midwestern boy who has a chip on his shoulder and feels out of place in the big city and Amy is a New Yorker through and through with a trust fund and no need to work. Both however are writers and they seem to be the epitome of a loving couple. Amy’s parents are writers too and they penned a hugely successful children’s fiction series titled Amazing Amy. However Amy herself isn’t mirrored in the stories that her parents write. Where Amy fails, Amazing Amy succeeds and her fictional counterpart lives out the life that Amy’s parents aspired for her. It’s an interesting set up and it ensures that Amy also has a chip on her shoulder. So Amy and Nick attempt to carve out a life in New York City. But with the news that Nick’s mother is unwell and dying from cancer the pair head out to the mid west. Nick is immediately at home and opens a bar with his sister titled (very meta) The Bar. Amy however is unhappy, lonely, and bored in the American backwoods that Nick brought her to. The pairing of Ben Affleck and Rosamund Pike works very well. They don’t actually occupy much screen time together but when they do they fizzle and spark and their differences make them both a perfect couple and ensure that they will never be happy together. Affleck’s performance is subdued, quiet, and his everyman charm is the antithesis to Pike’s sophisticated elegance. Gone Girl’s narrative is character driven and the casting choices really ensure that this element of the story works. So we have a loving couple that has been forced by circumstance to leave their New York home and change their lives drastically. This change doesn’t lead to happiness and it seems that their relationship is suffering. One day Nick returns home to find his wife missing, signs of a struggle in their home, and a complete lack of knowledge as to where she has gone. The police become involved and Amy is portrayed in the news (and via excerpts from her diary) as an all American girl, a loving wife, and a tragic missing person. Her narrative inspires women all across the country and she develops quite a following. It’s all about appearances though and contrary to Amy’s ‘success’ Nick becomes a suspect in her disappearance. Clues begin to surface and it looks like Nick was an abusive husband and that he finally murdered Amy in a fit of rage. This is the strength of Gone Girl and the narrative really provokes thought and conversation. Truth it seems belongs to those who can articulate it best and for those who can’t it’s very difficult to curry public favour. People are quick to judge and they love to latch on to a strong narrative. Nick finds himself in a world that doesn’t appreciate him or even want to hear his side of the story. It quickly becomes imperative that Nick finds Amy. This provides a certain irony as Ben Affleck once more finds himself Chasing Amy. Gone Girl originates from the pen of writer Gillian Flynn. She adapted her novel and wrote the screenplay for David Fincher. Her stylistic narrative touches have made it onto the big screen and her deft portrayal of Amy works especially well. Amy is never really introduced (at least not until the third act) and she is seen as a myth – both of her own creation and by those around her. It’s a story that pokes holes in the marriage narrative and suggests that perhaps it isn’t quite the happy ending that participants hope it to be. Gone Girl is a long film but it never drags or feels slow. Instead it focuses on mood, tone, and character development in a way that only film could. It’s a journey; it’s an exploration of people, and a study of marriage in minutia. The ending however is straight out of a horror film but the film deftly links the increasingly scary consequences with the realism of the opening act. This is David Fincher doing what he does best. Gone Girl is a thriller with twists, turns, and shocking developments. It’s worth watching for a number of reasons. It’s expertly framed, loving coloured, and carefully cast. It’s a mercurial narrative and one that forces audiences to ask uncomfortable questions. As Nick asks, “What have we done to each other?” audience members may find themselves asking if they can every truly know someone else.